Seven Explorer Scouts from The Grammar School at Leeds (GSAL) have earned the highest award possible for a member of the Scout movement. The Queen’s Scout Award recognises a Scout’s exceptional achievement; to earn it a Scout must have been an active member for at least 18 months, gone camping regularly, and completed projects in the spheres of community, values and international friendship. In addition a Scout must spend a year developing a skill, engage in physical activity and volunteer for the benefit of others. He or she must also complete a five day residential course, such as the National Citizen Service, and a four day backpacking expedition. GSAL’s scouts visited the Yorkshire Dales for their expedition. 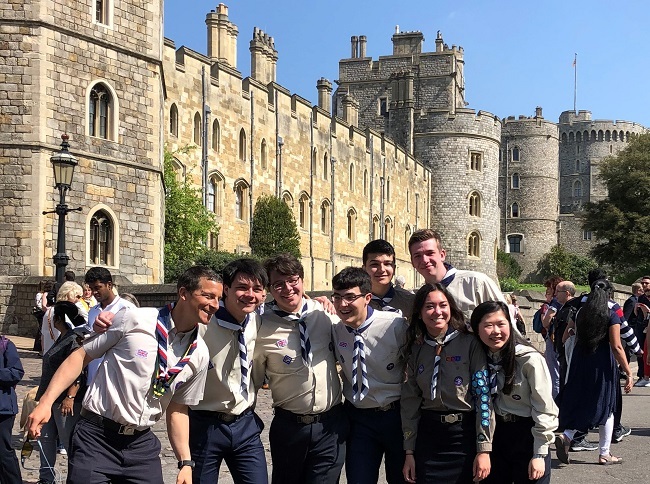 All seven of GSAL’s new Queen’s Scouts travelled to Windsor Castle last weekend for a special day of celebration and achievement for scouts and adult award holders nationwide. The event included a parade by the scouts and a service in St George’s Chapel. In attendance were Princess Beatrice, representing the royal family, and the Chief Scout Bear Grylls, who both congratulated the scouts individually after the parade. The GSAL group even managed to grab a few photos with Bear! Daniel also expressed the group’s warm appreciation to GSAL Scout Leader Alan Naylor, who could not be there on the day. GSAL’s Queen’s Scouts will receive their certificates from the County Commissioner at the Scouts AGM in school this Friday.